I plied two skeins of yarn some years ago. I used several left overs that looked pretty good together. Out came one of the ugliest yarns I’ve ever spun, so I tried to forget all about it. A couple of weeks ago I happened to see the skeins beside a dark grey commercial Merino/Silk yarn when I was looking for something else in my yarn stash. Wow, I thought. I started to knit at once. I saw there wasn’t enough of the handspuns, but thought I’d find something for the ribbings later. As always when I’m not sure I have enough yarn I started knitting without ribbings and cuffs. I add those later. I wanted to knit winter pants for my granddaughter, so I dyed a white Finnsheep yarn red. As always, I have several knitting going all the time. One evening the pants lay on the sweater. Wow, I thought. I dyed some more red yarn. There’s silk, Merino and probably BFL in the sweater, also in the handspun yarns. It’s fairly thin, and it feels lovely. After having it on for a few hours I know I’ve made a new favorite winter sweater. It’s warm, but not hot, and it’s very soft. A worthy sweater to celebrate Wovember! I listen to audiobooks, the radio, or podcasts while spinning. 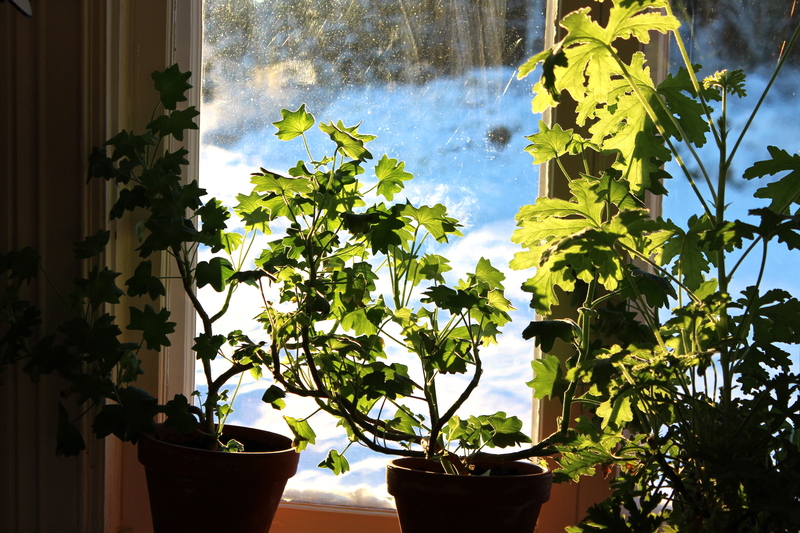 On this beautiful day with sunshine, so rare in November, and fresh white glittery snow, I listen to a program on the Swedish radio about Britta Marakatt-Labba. She is a textile artist with embroidery as her prime technique. Her art is delicate, but often also makes you think. She’s talking about her art, and how she sometimes adds pieces of fish skins or other traditional Sami materials to the embroidery, or how she uses woven flour bags with swastikas left behind by German soldiers during the second world war. She’s working on a picture that tells about the horrific bombing and shooting in Oslo in 2011. She thinks a flour bag with swastikas is a very suitable fabric to embroider such a picture upon, as the Nazi ideas and the ideas of the terrorist in Oslo are much the same. She pictures not only the nature and Sami culture, but also things that upset her. The radio program is called “Vassa stygn”, “Sharp stitches”. I think the best way to find photos of her art is to google her name and go to the Images hits. 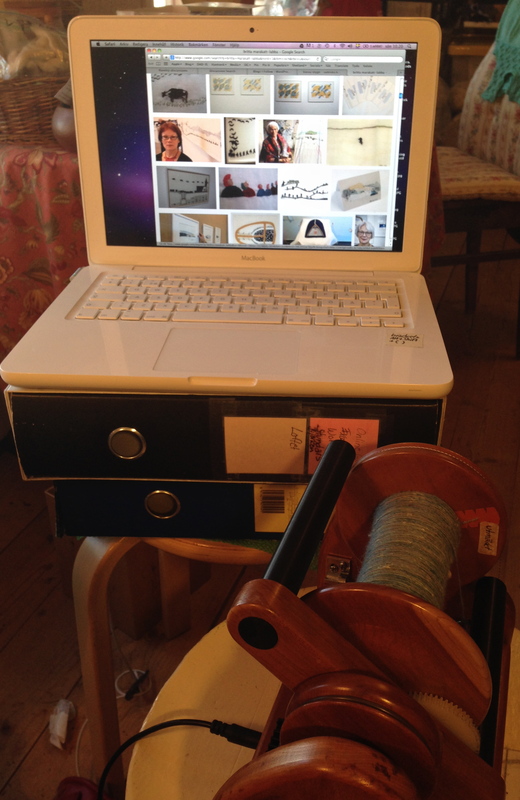 My Wovember spinning is progressing, but not quite to plans. 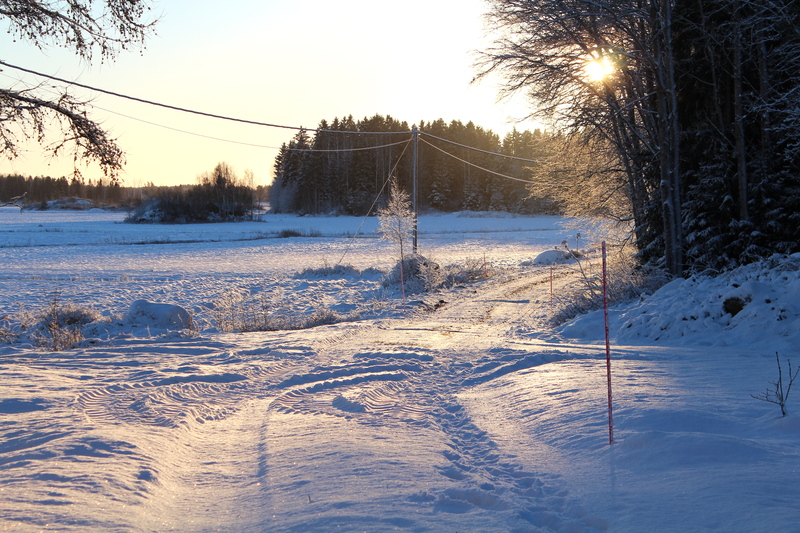 I had planned to visit a sheep farmer last week in order to fetch a few Finn and Åland fleeces, but as so often things came in between, so I will go at the beginning of December instead. Today I spin a blue Swedish Finull-Silk blend. Earlier this month I carded wool I had acid dyed in October, and added light green silk top and white silk waste. The result is a very soft but a bit “chewy” prep that doesn’t spin quite even, but has a nice texture. I’m still exploring six Nordic Short Tailed sheep breeds’ wool: Finn, Kainuu Grey and Åland sheep from Finland, and Finull, Gotland and Värmland sheep from Sweden. 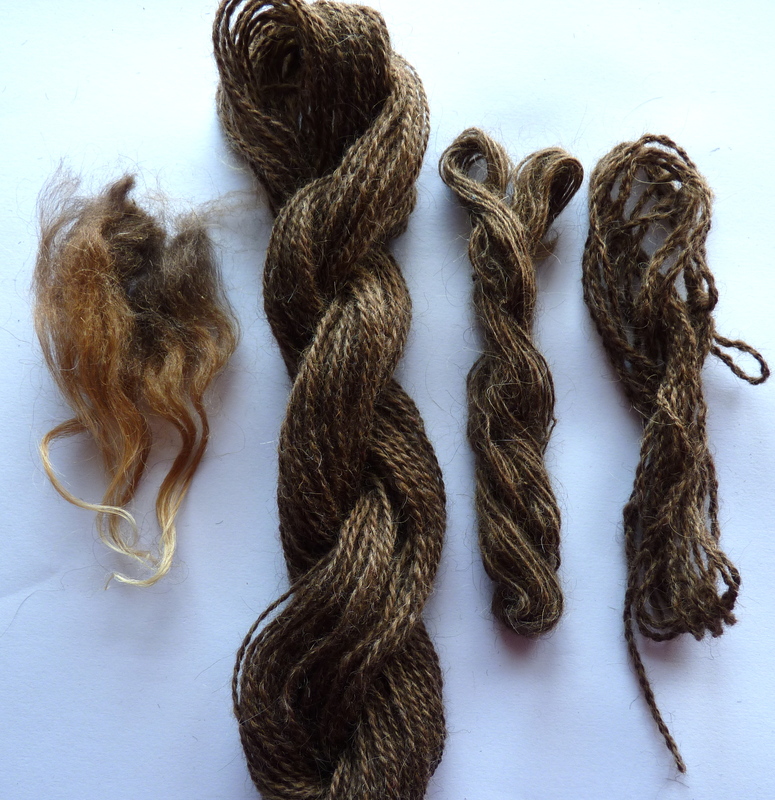 I have now spun a few samples of Finn, Finull and Värmland. I hope to continue next week with Gotland and more Värmland. If you haven’t already noticed: Kasper is always helping me. I love that dog. The hand of the two wools is also the same. 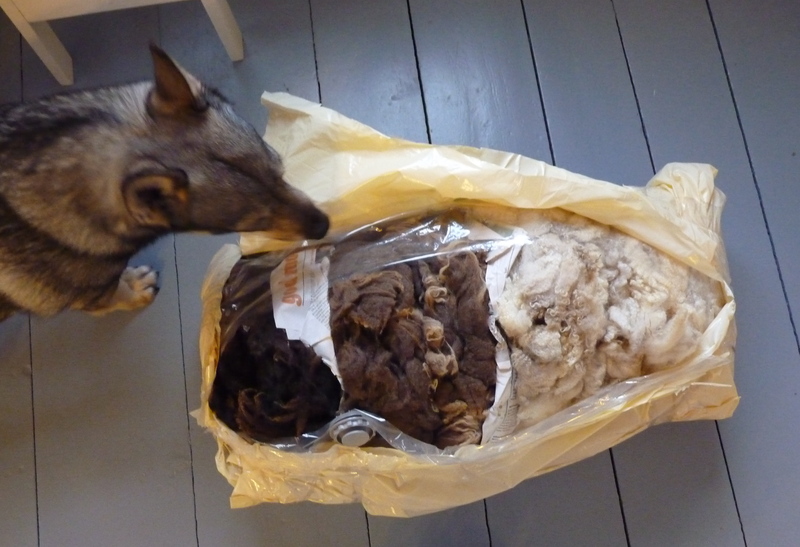 Soft, nice, much of it is next-to-skin wool, but there are also more robust fleeces. It’s wool that can be used for many purposes from soft baby clothes to blankets, upholstery and even rugs. It’s often short here in Scandinavia as the sheep are sheared twice a year. 5-7 cm is an average. 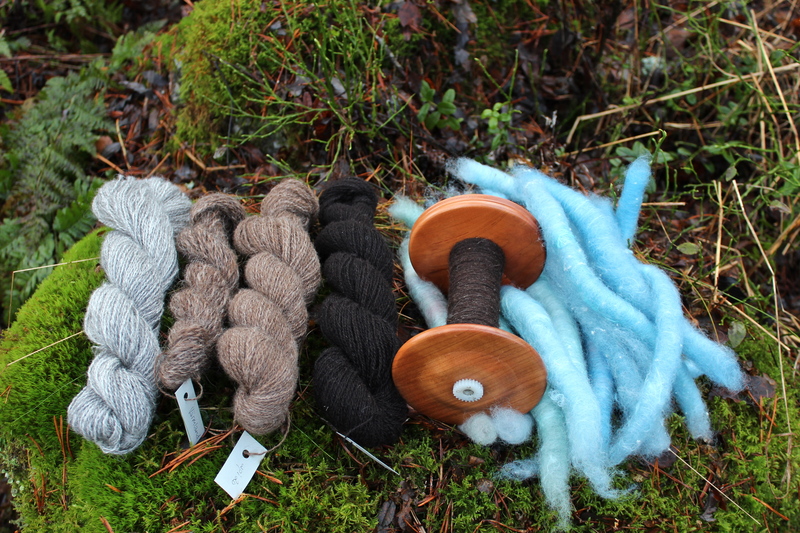 Värmland is another type of wool. I will return to it later, so let’s only mention it’s a primitive type of wool. Double coat, everything from very soft to harsh. All colors from white to black. 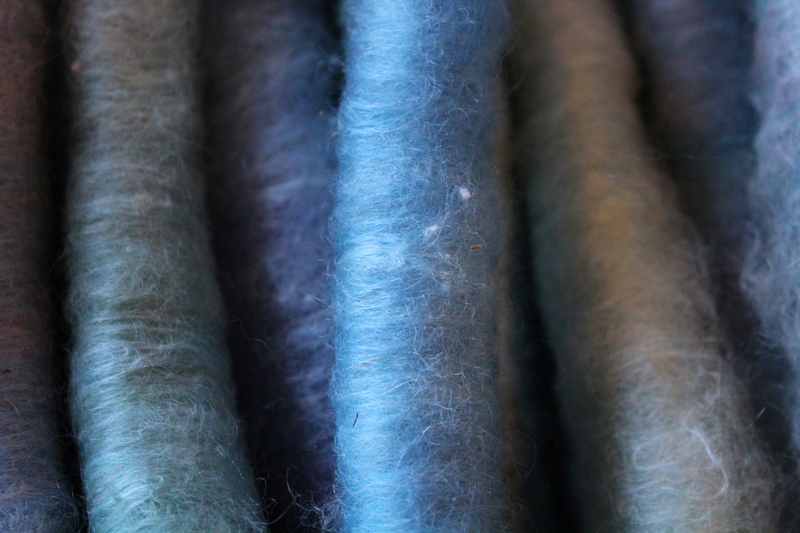 A very interesting wool, as primitive wools often are. This is an older photo of Värmland I spun a couple of years ago. The triangular lock structure tells you there’s both long guard hair and soft undercoat. The guard hair can be picked or combed out if you want two different kinds of yarn from the same fleece. 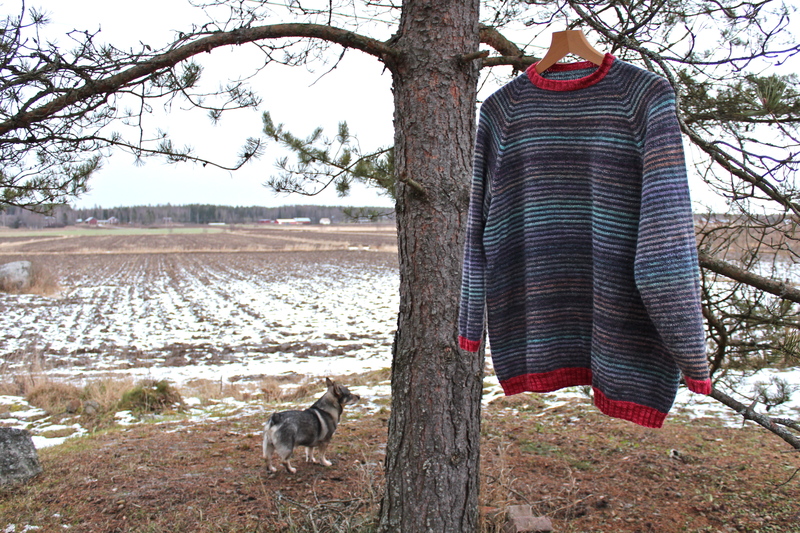 I have written about Kainuu Grey here. Half of Wovember is gone. 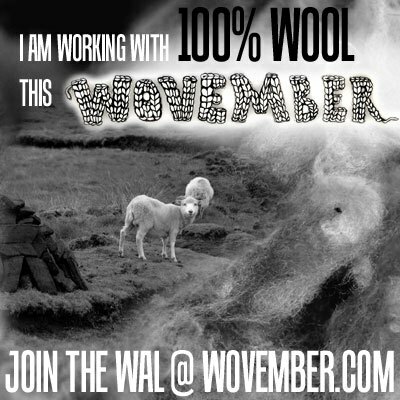 I have loved reading the Wovember blog (link in the Blogroll). 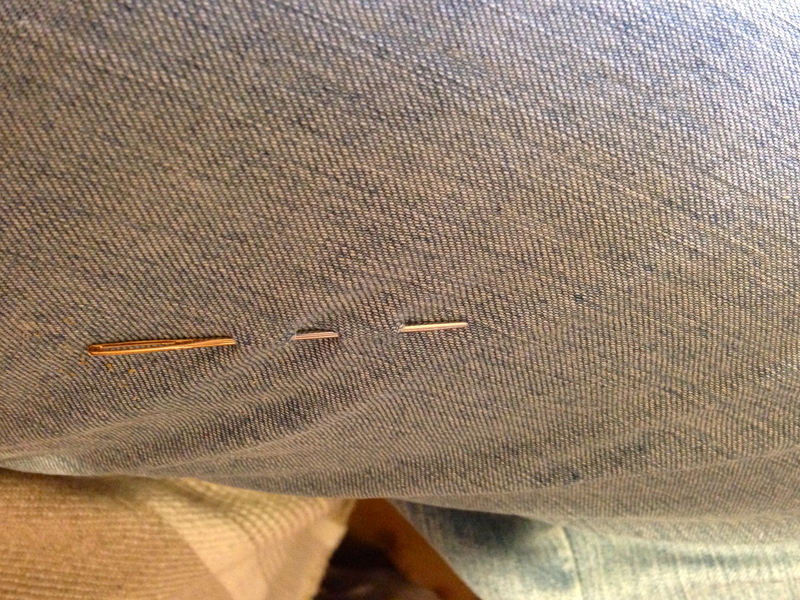 Maybe I should honor Tom of Holland by mending something, and also showing some of my mended socks in another post. Yes, I think I will. 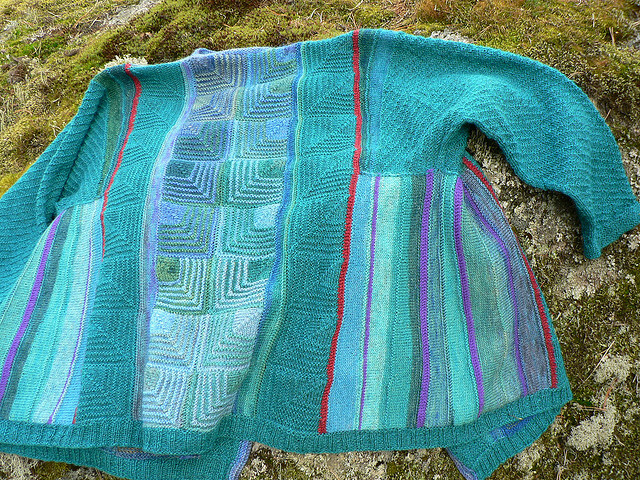 I knitted this cardigan from small hand dyed skeins and a teal commercial yarn. The mini skeins were dyed in beautiful blue, brownish, lilac and green shades by spinning friend Ingrid in Sweden. I loved the cardi, but the last couple of years it felt as if it didn’t quite fit me anymore. Today I turned it into a sweater by simply sewing the two front pieces together. Voilà – sweater! And it fits me again! It only needed to be more firm at the front. On request after publishing this post I added an old photo of the back. 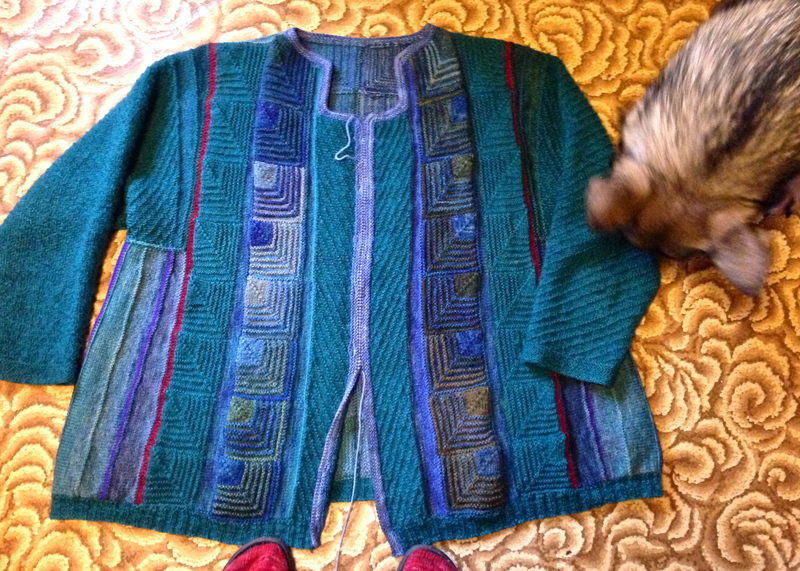 There are several photos of the knitting progress in my Ravelry stash. I think this fits very well in the Wovember theme. Reuse, mending, pure wool. I’ve always wanted pockets in the cardi, but never got myself to making them. I think I’ll make pockets now. Pockets for things I use when working: small scissors, yarn gauge. Knife. Phone. Needles. No. No needles. Those I attach to my jeans, forget where I put them, and find them the next day. Eventually. I couldn’t resist showing my red socks also. Because, very soon I will change from sandals to shoes indoors, and I will see my socks only in the mornings and evenings. 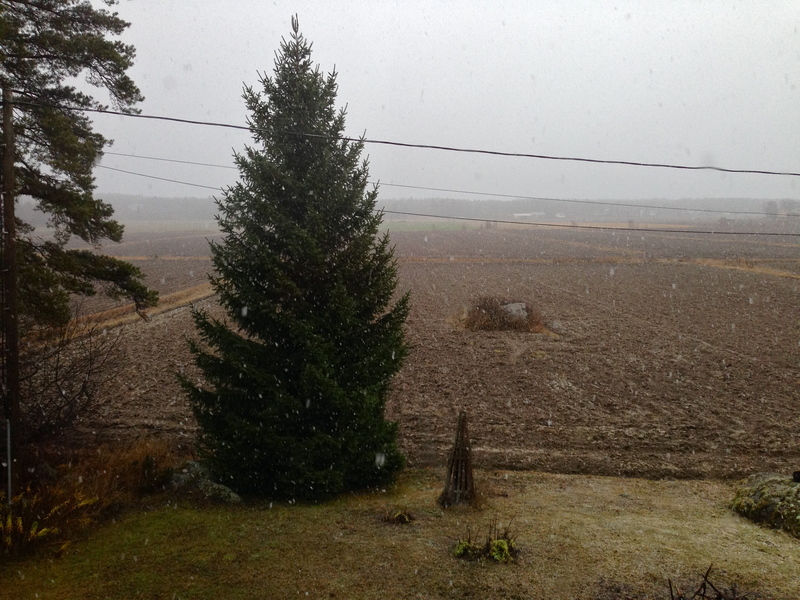 It’s snowing. Sandals go to sleep like bears in the winter.